Fears over consumer spending may dominate the High Street but internet shopping is enjoying robust health, official figures show. The Office for National Statistics (ONS) suggested online shopping continued to thrive in January, and represented 6% of all UK retail sales. It grew 19 times faster than in traditional "bricks and mortar" sector in December - a month in which retailers can make up to 40% of their annual profits. And internet retailers - or "e-tailers" - said many customers who used their services for Christmas gifts have since returned, prompting another surge in online shopping in January. "The High Street was a lonely place in January - winter sale posters in the window had very little effect," said Malcolm Wilkinson, managing director of Speeding.co.uk, the online car accessory store. The office suggested that online shopping increased by 5% in January, while mainstream shops saw a 44% slump. "Canny shoppers found bargains galore online, and waited for the January sales to make many purchases, thereby applying pressure on margins," said Jo Tucker, managing director of the Interactive Media in Retail Group (IMRG) index. According to the ONS, e-tailing grew by a further 5% in January, after clicking up another £1bn in sales. Online outlets said a major attraction for shoppers was the ability to compare prices on the internet - a far easier method than trawling up and down High Streets. Shoe-shop.com expects "A vintage year". Paul McDonnell of Dvd.co.uk said their internet promotions had prompted an 800% leap in sales. "We noticed sales increased dramatically within minutes of posting the promotions." The range of products enjoying a boost to sales is also growing. Books, CDs and DVDs - once the cornerstone of online shopping - have made way for everything from underwear and shoes to wine and furniture. 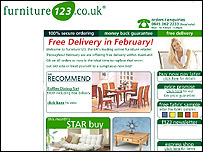 "January was a record year for us with sales up 250% on last year," said Julian Field, managing director of Furniture123.co.uk. 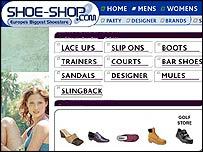 Tim Lodge, managing director of Shoesdirect, said the combination off on- and off-line sales worked well. "We have High Street shops and understand how important the January sales are to our own business, which has helped us mirror this trading opportunity online." Fellow shoe-seller Stuart Palver, of Shoe-shop.com, added: "It looks like 2003 is set to be a vintage year."